Mad Men is an American dramatic television series created and produced by Matthew Weiner. The series airs on Sunday evenings on the American cable network AMC and is produced by Lionsgate Television. It premiered on July 19, 2007, concluded its fifth season on June 10, 2012, and has been renewed for a sixth season. Mad Men is set in the 1960s, initially at the fictional Sterling Cooper advertising agency on Madison Avenue in New York City, and later at the newly created firm Sterling Cooper Draper Pryce. 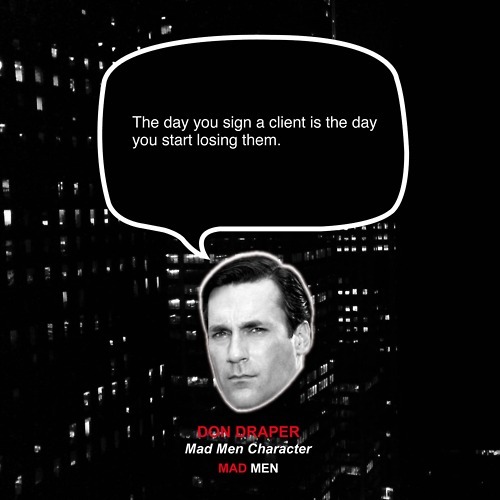 The focal point of the series is Don Draper (Jon Hamm), creative director at Sterling Cooper and a founding partner at Sterling Cooper Draper Pryce, and the people in his life, both in and out of the office. The plot focuses on the business of the agencies as well as the personal lives of the characters. As such, it regularly depicts the changing moods and social mores of 1960s America.